I need some guidance. Stat! My youngest son was invited to a bar mitzvah party with a sports theme and the kids are all wearing jerseys. He didn’t have one and asked for a Redskins jersey. With everything going on around here (and it’s a lot! ), the task of finding a jersey for him ended up on my list. No problem. I went to Kohl’s and Target first. Since it’s baseball season, you can imagine that I didn’t fare well. So, instead of running around town for another several hours or more, I went online. I found a ton! I bought the one that appeared to be the best quality for the lowest price. With pride, I held it up for the kid and my hub to see. I didn’t know! Would you let him wear it or rush out and find another? Help me! Wow! I wouldn’t have known either. If the reaction had been *first*, thanks so much for your effort but, ummm, there’s a problem…..then I would certainly go find another one and resell the current one back on eBay. If the reaction instead was, Mom you’re an idjut, I’d say, deal with it and spend your own money. It’s the thought that counts. YMMV, of course. Actually, the kid was super appreciative and said he’d wear it. But he was a little shocked! He’s a sweetie – really. Oh. The. Irony. Let him wear the shirt. Talk about a conversation starter! It sure would be a convo starter! 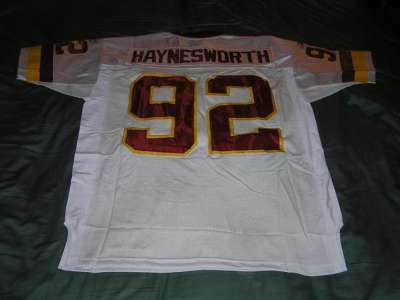 We are also Redskin fans and I would have known why the jersey was so cheap… I think someone in my house has a similar one. The letters are probably sewn on, so you could remove them, and if you are feeling industrious re-arrange them to spell something else! Let me know if you want to borrow a jersey, I think Gracie has a Donovan McNabb, among others! That’s hysterical – what a good idea! Thanks for the offer, I think we have a couple borrowing options lined up! That is actually quite humorous. I wouldn’t have known anything about the player’s name either. I once bought Corey a football jersey, on sale, and found out once I got home that the player had been traded from that team to another, hence the sale, and he wouldn’t wear it so back to the store it went. fwiw, the first ravens jersey i bought jack was a ray lewis. didn’t know he was the guy on trial for murder or whatever. don’t think i would have bought it had i known. LOL! Maybe it’s time to read the sports section. Sigh. Ha! I’m sorry, I think it’s soooo funny because I would have been totally clueless, too. Since mine don’t follow the Skins, I wonder if my husband and/or son would have even known???? Glad you have some borrowing options. Good luck reselling it BACK on ebay! Thanks! Not sure anyone will want to buy it, though! Simple fix: Black magic marker, write “SUX” below the numbers. You can say that you got it when we all though he was a G-d send, but now we know the truth. A little controversy will spice up the party.